The big story this month has to be the massive drop in closed sales during the month of April. Not only was this uncharacteristic for this time of year, but definitely unexpected given the massive jump in pending sales the past three months. There is obviously something going on that is preventing all these under contract properties from making it to the closing table. Other than closed sales being way down, all other market trends indicate we are in one of the strongest seller’s markets we’ve seen in nearly a decade. However, I think this seller’s market is so strong that, it’s actually preventing homes from selling. In a blog post I wrote a couple weeks ago, I explain how bidding wars can actually hurt home sellers. In a market where seemingly every property goes under contract in days, it’s hard to believe that closed sales are down nearly 25% from where they were last year. We saw signs in March that closed sales were declining (down 3.6% YOY), but the huge drop in April was unexpected. Some will argue that there are less properties on the market, therefore, not as many are selling. However, the actual number of properties under contract (not percentage) is much higher than it was last year. So far this year, pending sales have been through the roof! As you can see in the chart below, year over year new pending sales were up 8.3% in January, 26.8% in February, and 26% in March. In April, there were 9,672 new pending sales, representing a 24.1% increase over April of 2015. However, the increase in the total number of pending sales was even more significant, jumping 57.7% year over year to nearly 16,700 properties under contract. This is a huge contributing factor to the lack of active inventory, and should result in a huge increase of closed sales in the coming months… if buyers and sellers can make it to closing. The number of active listings was up in April compared to a month earlier, but it wasn’t because of a jump in new listings. In fact, new listings remained fairly stable at around 12,100, but the drop in closed sales meant more properties were still "on the market". Compared to last April, active inventory was down to 24,700, nearly a 10.5% drop. The five year average in April is roughly 27,500 listings, so we’re still around 3,000 listings under where we have been in the recent past. This month, things seem to be at one extreme or the other. While the influx of new listings is welcomed, properties are still going under contract so quickly it doesn't allow the active inventory to grow much. 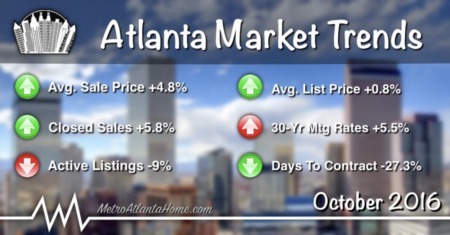 This demand has caused the median sale price to rise along with the list prices, as you can see below. Despite the higher list prices, sellers are still getting 96.8% of their original list price, and properties are closing in a mere 65 days! 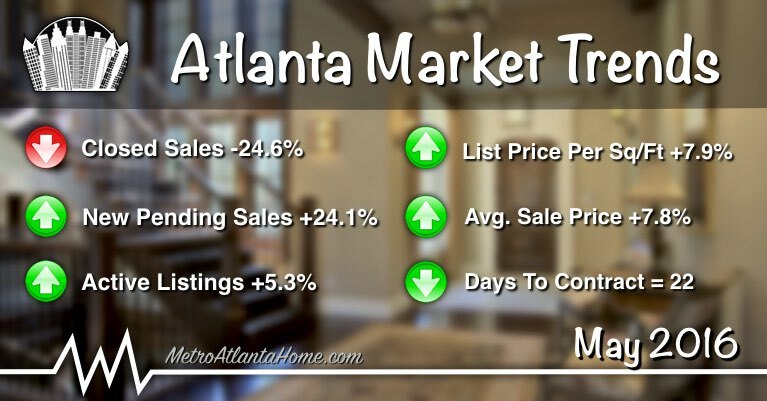 As it has since last December, the median asking price of new listings in Metro Atlanta increased in April. Now up to $109 per sq/ft, the median list price increased 7.9% compared to April of 2015. As you can see from the chart below, the median list price for all active listings starts to increase in January with anticipation of the spring buying season. Despite the jump in prices, buyers have demonstrated they are more than willing to spend what it takes to get the house they want. Rising list prices, along with bidding wars caused by elevated buyer demand, will surely result in price appreciation in the coming months. The combination of low inventory and high buyer demand has definitely benefited sellers looking to get a premium for their property. As you can see in the chart below, prices start to rise this year, and they've already surpassed last summer's high of $270,715. In April, the average sale price reached $274,823, a 7.8% YOY increase! This hot market should continue to yield increasing home prices as we head into the summer months. A clear reflection of the seller’s market we’re in, the median days to contract recently hit a multi-year low. In April, the median days to contract dropped to 22, down from 28 days in March. It’s typical for the number of days on market to drop this time of year, but April’s mark was historically low. In the past, the median days to contract has continued to decline in May and June, so look for properties to start going under contract even quicker in the coming months. How low can it go? 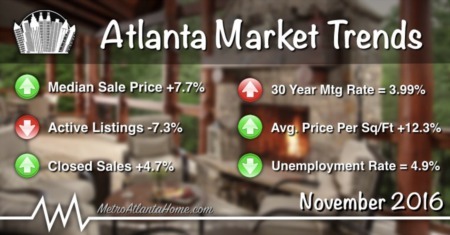 Last month, closed sales were way down in Alpharetta, dropping nearly 39% year over year. New listings were up 6.9% YOY, and pending sales were only up 6.1% in April. The shortage of active listings in previous months helped drive prices up to just over $395K in the first quarter of 2016, and resulted in the median days to contract dropping to 16. The number of homes for sale in Brookhaven was up 5.6% compared to April of 2015, yet closed sales were down 31.6% compared to the year prior. There were 174 new listings that hit the market in April, representing a 13.7% increase YOY. Average sale prices in Brookhaven topped out just short of $490,000 in the first quarter of 2016, with average list prices at $211 per sq/ft. The number of active listings in Buckhead reached 317, the highest it’s been since August of 2012. New listings increased 2.3%, new pending sales were up 4.5%, yet closed sales were down 20%. The average sale price actually dropped 1.6% in the first quarter of 2016, ending up at $592,169. REO sales in Q1 of 2016 fell to one, representing a 90.9% drop from Q1 of 2015 (11 REO sales). The housing market in Chamblee has been hot, with average sale prices increasing 12.2% to $325,332 in Q1. 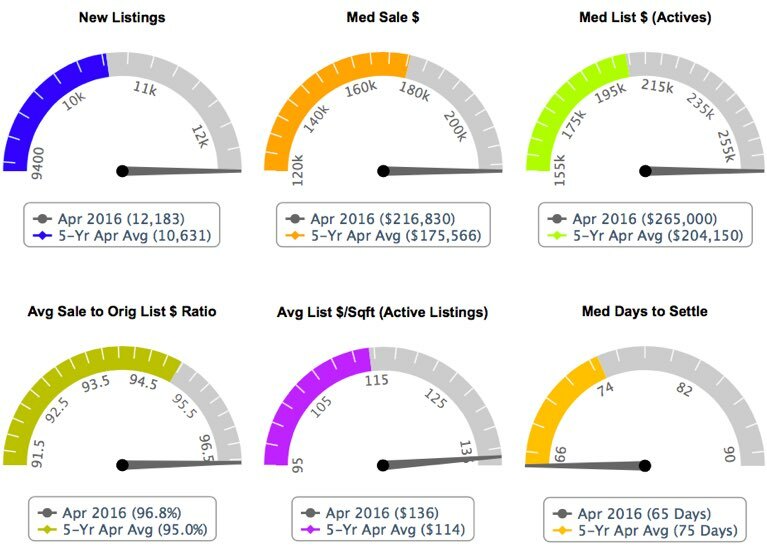 Active listings were up 8.6%, but closed sales in April dropped to 26, nearly a 47% decline. However, new pending sales were up 43.2% compared to last year, and the average list price per sq/ft for new listings was up 15.9%. The median sale price to original list price ratio dropped only slightly to 97.5%. In April, there were only 100 active listings in Dunwoody, representing a 10.7% drop from a year earlier. In addition, closed sales were down 31% YOY, from 58 in April of 2015 to 40 last month. New listings also dropped 3.5% compared to last year, yet, pending sales were up 24.1%. Average sale prices hit their highest point in more than five years, increasing 6.5% to $403,517 in the first quarter of this year. The median days to contract was down 56.3% year over year, at 7 days. Having been down double digits to start the year, the year over year percentage change in active listings was only down 3.4% in April. New listings increased 8.8% compared to last year, and new pending sales were unchanged. However, like the rest of Metro Atlanta, closed sales in Johns Creek were down more than 32% compared to the prior year. Average sale prices in Q1 skyrocketed to $399,088… more than an 18% increase from Q1 of 2015. The active inventory of homes for sale in Roswell was down considerably from the year prior, reaching 389 listings, a 19% drop. Closed sales also dropped off, finishing up the month more than 41% lower than they were the year prior. New pending sales were down only slightly at 1.9%, and new listings were 8.4% lower than the year prior. Home prices soared 14.1% YOY in the first quarter, yet the average list price per sq/ft of new pending sales was down 0.7%. The Sandy Springs real estate market showed some signs that things might be slowing down. Active listings were up 5.8% compared to last year, and closed sales were down 47.6%. New listings were up 32% YOY, however, new pending sales remained flat. The average sale price was up compared to the year prior, but declined from Q4 of 2015. The median sale price to list price ratio was also down 0.4% YOY to 95.9%. However, the average list price per sq/ft of new listings and new pending sales were both up 11.3% and 4.6% respectively.